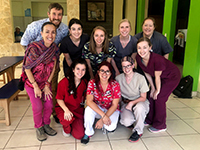 A group of Duquesne University School of Pharmacy faculty and student pharmacists completed a service trip to Costa Rica over Spring Break, extending the mission of the School of Pharmacy–to improve the health outcomes of patients and the community–beyond the United States borders. Led by Dr. Jordan Covvey, assistant professor of pharmacy administration, and Dr. Kevin Tidgewell, associate professor of medicinal chemistry, PYIII student pharmacists Brooke Lalley, Danielle Schillero and Rachel West and PYII student pharmacists Sydney Keremes, Amberly Morningstar and Camryn Vecera volunteered with several clinics and a church-based rehabilitation center in the Purral, Tejarcillos, and Alajuelita areas of San Jose, Costa Rica. The student pharmacists provided general health assessments for children, which assisted in the provision of referrals for further medical care. Additionally, the student pharmacists worked collaboratively with a physician in providing assessments and treatment for adults. The trip gave the student pharmacists the opportunity to experience and learn about a healthcare system outside of the United States. "Costa Rica is one of the more developed countries in Central America, and we were told that healthcare is generally free," Morningstar said. "Throughout the week, we learned that despite some aspects of healthcare being free, a lot of people still don't have access to it. Some services must be paid for by the patient, which many people cannot afford, and other services it is difficult to get in for a visit." The areas of San Jose that the student pharmacists volunteered in include large immigrant communities that may not have regular access to the healthcare system. The student pharmacists found the patients to be extremely grateful for the assessments and entire neighborhoods started showing up once word spread. Despite managing large groups of patients and communicating amidst language barriers, the student pharmacists took the time to understand the needs and concerns of the patients and provide appropriate care and counseling. "My favorite memory from the trip was getting through to a patient who did not want to take his medication," Schillero said. "He was young and seemed reasonably healthy. His blood pressure was extremely high. After spending the day with him and getting to know him, he informed me about his past drug use...I was touched he trusted me to share this information with me. I understood why taking any medications scared him when he had been clean for two years. We had a good conversation about his health, and I felt that I really got through to him and made a difference. He will always stick with me as I help patients in the future." The last day in particular stuck out for several of the student pharmacists. "We screened patients who were staying at a rehab center," Keremes said. "In the afternoon, they also brought their neighbors and friends...Those were some of the most welcoming people the whole trip. It was just so fulfilling to be helping these people because of how grateful they were. When they saw us, their faces lit up, and made our job so easy to want to help them and care for them. They were eager to learn English from us, and they also taught us a little bit of Spanish. Exchanging cultures and providing them healthcare services meant the world to them that day." 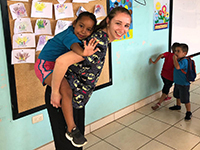 The School of Pharmacy hopes to continue offering Spring Break-Away service trip opportunities in the future to provide student pharmacists with a global health experience. "I would definitely recommend that students go on this trip," Vecera said. "It was a very eye-opening experience. You get to meet other people in pharmacy, get to know professors, and get to help people who are in need. I think it is a great opportunity to grow as a person and to grow in your future pharmacy career." 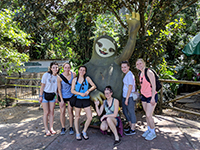 In addition to the service component of the trip, students visited Irazú Volcano in the Cartago Province and Manuel Antonio National Park in the Puntarenas Province, practiced Spanish, ate local cuisine, explored the city of San Jose, and engaged with locals in true ‘pura vida' fashion. 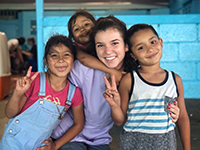 International Volunteer HQ (IVHQ), the largest volunteer abroad organization in the world, and Maximo Nivel, a leading educational travel and study abroad organization with programs in Costa Rica, Guatemala, and Peru, helped make the trip possible. Maximo Nivel Medical Specialist Tatiana Cubillo Jimenez managed all the projects for the trip, and donations through a Duquesne Spirit Crowdfunding campaign helped fund the travel expenses and cover the cost of donated medical supplies. "We are so thankful to Maximo Nivel and their care in hosting our trip to San Jose," Dr. Covvey said. "Our team was able to see and learn a lot about healthcare and culture in Costa Rica, and I have no doubt that this experience will help to shape the future careers of our students."